The Maldives, with its sun-soaked resorts and vivid turquoise waters, epitomises luxury and Instagram perfection for a breed of cashed-up holidaymakers and honeymooners. But the reality of the island nation is vastly different: creeping Salafism and hijabs, political uncertainty, and a gradual erosion of democratic freedoms, set against a backdrop of Chinese-funded infrastructure projects, all thanks to the former President Abdulla Yameen. But a win by opposition candidate Ibrahim Mohamed Solih last month – upheld this week by the country’s Supreme Court – looks set to change all that. Yameen had argued in a bid to prevent Solih from taking office that the 23 September election results were rigged. Yet on Sunday, this was unanimously rejected by the Supreme Court. The ruling means Solih, who ran on a platform of restoring democracy, dealing with corruption, and mending relationships with the West, is likely to take the leadership – unless Yameen comes through with another stalling tactic. For a nation with little economic clout, the Maldives’ geopolitical position has, of late, made it more important than ever. The potential for the leadership change is massive: not only is Solih’s win being hailed as a win for democracy, it could alter the pace and amount of Chinese investment in the Maldives, and shift the power balance between China and India in the Indian Ocean. For a nation with little economic clout, the Maldives’ geopolitical position has, of late, made it more important than ever. Abdulla Yameen has been president since 2013, and in a relatively short time has established himself as an authoritarian leader with a strong will to cling to power by any means possible: in February he declared a state of emergency that lasted 15 days, and had police arrest two Supreme Court justices as well as the former president Abdul Gayoom his own half-brother. It was part of a wider power struggle with the Supreme Court. Democracy isn’t old in the Maldives, which has a population of just 430,000, spread across 187 islands. The country’s first democratic election was in 2008, won by Mohamed Nasheed, who was forced from office just four years later and beaten by Yameen in an election the following year. Nasheed was sentenced to jail for 13 years on terrorism charges, described by Amnesty International as politically motivated. He has since successfully sought asylum in the UK. Since Yameen ascended to the presidency, he has established himself as authoritarian: and in particular, he has opened the door to more conservative Islamist mores. The Maldives was traditionally a moderate Islamic nation, but in recent years has become increasingly strict. Last year, a critic of Islamic radicalisation was killed, and scores, perhaps hundreds, of Maldivians have been recruited into ISIS. The Indian Ocean is shaping up to be a key battleground in the regional power struggle between the two Asian behemoths – China and India. Indeed, this election was seen in some quarters as a proxy battle between the two giants. 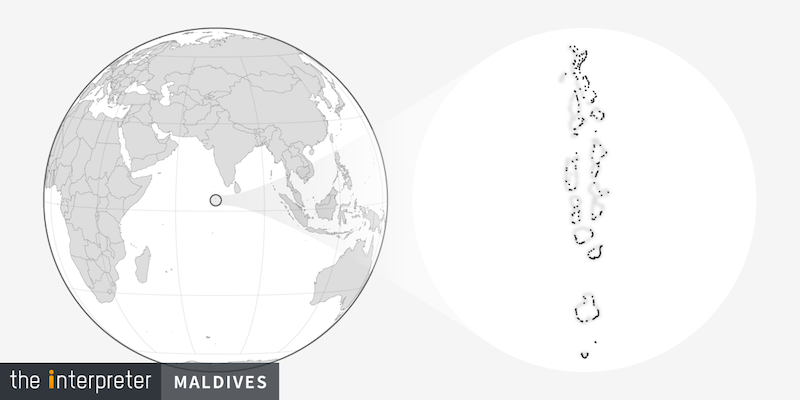 The Maldives lies around 700 kilometres from India’s southeastern coast, and is located close to international sea lanes through which container ships and oil pass. Traditionally, India has considered the Maldives falls under its regional purview, but a recent injection of Chinese money has altered the balance. Beijing has, in recent years, pledged to finance a heap of infrastructure projects – upgrading its international airport, building a 1.4 kilometre bridge between Hulhule and Male, all part of China’s Belt and Road Initiative. A memorandum of understanding on the initiative was signed in 2014 between the two countries. These were enthusiastically supported by Yameen, however Solih has made it clear that he is not comfortable with the level of Chinese involvement, and any potential for China to use the Maldives as a convenient spot from where to view oil shipments and other sea traffic, but also a strategic staging post in its future plans in the Indian Ocean. According to the Center for Global Development, a US-based think tank, the loans from China to the Maldives come in at around $1.3 million – and the country is one of the most at-risk of any of those involved in the Belt and Road Initiative to failing to meet its repayments. It is not yet clear what, if any, Solih’s plans are in terms of dialling down Chinese investment, but audible sighs of relief from New Delhi indicate that India is confident that the scales will tip back in its favour.